The many amenities at our Alaska bed and breakfast make it an ideal destination for your family vacation in Anchorage, and also make our inn a desirable destination for the business traveler and those who are physically challenged. Our deluxe amenities are specifically chosen to make you feel at home while you’re on the road. If you or a traveling companion requires handicap-accessible accommodations, please see below for the accessible features available in our Fireweed Suite. Are you a road-weary business traveler who’s tired of drab hotel rooms that all look the same? Is a comfortable, relaxing atmosphere with all of the amenities necessary to do business important to you? Then you’re ready for accommodations that are homey and warmer than a hotel. Camai Bed and Breakfast is a wonderful alternative to Anchorage hotel lodging when you travel to the city on business. Check our availability; then call or e-mail to reserve your suite. At Camai Bed and Breakfast, we have the experience to provide the surroundings and amenities that contribute to a hassle-free stay. Wake refreshed, have a delicious breakfast, and head off to your business meetings. Our comfortable two-room suites are designed for business travelers wanting spacious accommodations. Each provides desk space, high-speed Internet, a private bath, queen-size bed, TV/DVD, refrigerator, coffee maker, microwave, and private telephone for complimentary local calls. An extensive library of DVDs is available for guest use at no cost. Wi-Fi is available throughout the bed and breakfast. Guests enjoy the business office area with a computer for checking their e-mail. For a touch of local Alaska flavor, let Craig and Caroline Valentine, original owners/operators of Camai Bed and Breakfast, provide you with not only a spacious comfortable room but also details about local events. 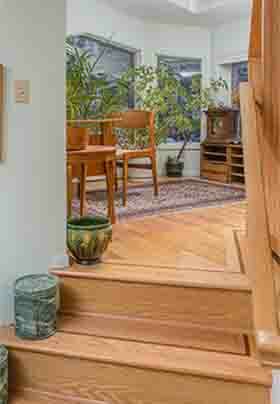 Camai Bed and Breakfast is in a quiet Anchorage residential neighborhood, which is very close to the University of Alaska, Alaska Pacific University, Providence Hospital, and Alaska Native Medical Center. Downtown Anchorage and the airport are a 15 to 20-minute drive from the B&B. The Fireweed Suite of Camai Bed and Breakfast offers some wheelchair accessible features including an entrance to the suite via a ramp from the suite’s designated off-street parking. The ramp provides hand railings on both of its sides. The kitchenette’s appliances and sink are within reach of a person in a wheelchair. The kitchenette’s appliances include a microwave, a small refrigerator, and a toaster oven. The door frames are at least 30 inches in width. The telephone, light switches, and thermostats are within reach from wheelchair. 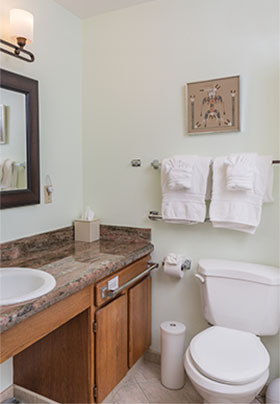 The bathroom of the suite features a taller toilet with a grab bar to the right and a grab bar behind. The bathtub has a hand-held showerhead, three grab bars, and a shower stool with transfer board. In the bedroom of the Fireweed Suite, the closet offers a rail at a lower height so a person in a wheelchair can easily hang clothing. If requested, a full breakfast during the summer is served to the Fireweed Suite guests in the kitchenette, where a guest in a wheelchair can use the height-appropriate eating counter. In the winter, a large continental breakfast is served at the counter. A guest may use the kitchenette’s counter to check e-mail using the complimentary Wi-Fi, which is located throughout Camai Bed and Breakfast. If you have questions concerning any details of the accessibility features, please e-mail Caroline for clarification.